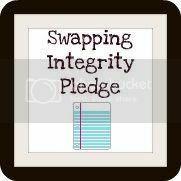 I, Ali, pledge to do my very best to have integrity and honesty in my swap commitments. To be on time, to participate in discussions, and to communicate if I am going to be late or unable to complete my obligations to my swap partner. Tiffany came up with this and I think it's great. Luckily I have never been on the receiving end of a swap flake, but I know that they are out there. I've always mailed on time (although sometimes just barely!) and completed my obligations. What about you? Do you want to take the pledge? ?